On the 21st of May 2011 at 12:30 PM, a new plaque will be officially re-dedicated to Cst. 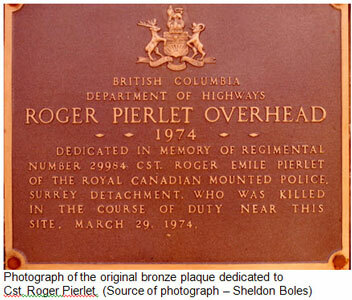 Roger Pierlet who was killed while on duty while working in Cloverdale. On the 20th of May 1976, the original plaque was officially dedicated to Cst. Roger Pierlet and was placed on the southside of the Cst. 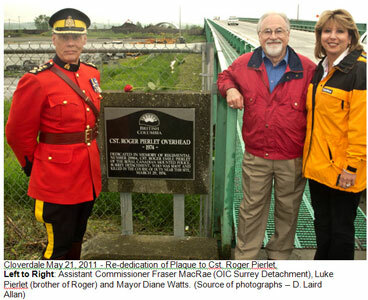 Roger Pierlet overhead bridge which was renamed in his honour.